I'm Not Naughty, I'm Sick! I’m Not Naughty, I’m Sick! I’m thirsty! An animal that suddenly starts to crave water, or even slowly over time begins to consume more water, can be trying to tell you that something is wrong. The size of the litter box clumps can be a clue in cats, who tend to be a little more secretive about their thirst and urination habits. Excessive thirst can indicate something simple and easily treated, like a urinary tract infection, or something more serious, such as kidney disease or diabetes. I’m hungry! Chances are, you know Fluffy’s eating habits pretty well. If she is suddenly meowing by the food dish or getting you up in the night to snack, this could be a subtle sign that something is wrong. Conversely, if Rufus is usually by the treat jar and suddenly loses interest, this can be a cause for alarm as well. Change in a pet’s appetite can indicate a variety of different illnesses, such as hyperthyroidism in cats, or Cushing’s disease in dogs, to name a few. 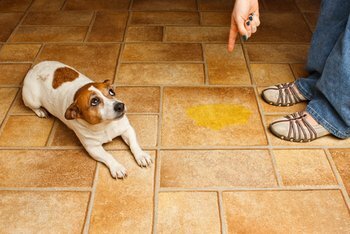 Even when your dog gets that ‘guilty’ look, an accident in the house could be an indication that something is wrong, such as a urinary tract infection. Before you chalk it up to your pet being bad, consider that there may be an underlying reason for the sudden lack of potty training. Dogs and cats are masters of disguise when it comes to pain. Most dogs will not cry out or whimper, even when pain is severe. Often, just subtle gait changes can indicate painful osteoarthritis. A limp, or favoring one leg is always an indication of pain; if the leg didn’t hurt, the dog would use it normally! Always consult with a veterinarian if your pet has changes in gait or trouble rising. 5. What Happened to My Pretty Coat? A dull, dry, or flakey coat can indicate a change in your pet’s overall health. Hair loss can indicate certain endocrine diseases, such as hypothyroidism, and flakiness and itching can indicate allergies. If Fifi is looking a little less shiny, consider seeing your veterinarian before a groomer. Especially with cats, hiding or a sudden decrease in social behavior is often an indication that something is wrong. If Fido always begs to go for walks, and suddenly seems to have no energy, chances are, something needs to be addressed. 7. Does This Collar Make My Tail Look Big? If you have been diligently measuring out Rex’s food like normal, but he seems to be packing on the pounds, or even looking leaner, it is important to make an appointment with the vet. Sudden weight loss in pets can indicate diseases such as diabetes or even cancer, while weight gain could indicate an underactive thyroid. Subtle changes in hearing and vision can be difficult to notice in pets. They can’t tell us that things are looking a little fuzzy. It is very common for older pets to lose some of their senses as they age, but a veterinarian is needed to ensure this loss isn’t due to an underlying problem, such as ear infection or growth in the ear, or changes in the retina or lens in the eye. Don’t just assume that old age is to blame for these changes in your senior pet. Excessive salivation can be an indication of a variety of different ailments, from something as simple as a stomach bug, to something more serious, like exposure to certain chemicals such as organophosphates. If animals could talk, it would certainly make our jobs as pet owners easier! However, being mindful of the significance of small changes in behaviors can help you decipher what your furry best friend is trying to tell you. For more information about pet health or to learn more about dog and cat insurance, visit Pets Best Insurance.